As a socially anxious, white-privileged slacktivist, “seriously discussing racial issues with people I don’t know well” ranks near “karaoke solo” on the list of things that discombobulate me. While I sense the wrongness of this unease, it feels personal, a predictable consequence of my conflict-avoidant personality. However, as black churches burn throughout the South, just months after Duke altered plans for Muslim worship for ostensible safety reasons, and in the wake of other racially charged incidents on campus this spring, I recognize the communal danger of trepidation like mine. Aggregated across many people, it is arguably one of the linchpins of the large and devastating problem of structural racism, as mass circumvention of the issue fosters its persistence. So, here I go. I will share with you how my colleagues at the Nicholas School taught me that we have to discuss difficult topics with people we do not know well, to confess the limits of our knowledge and power about these issues, and to appreciate others’ expertise, if we want a chance to foster real, needed change. 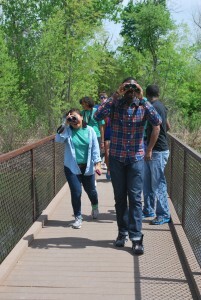 Duke Immerse students explore the Trinity River Audubon Center in Dallas, Texas. 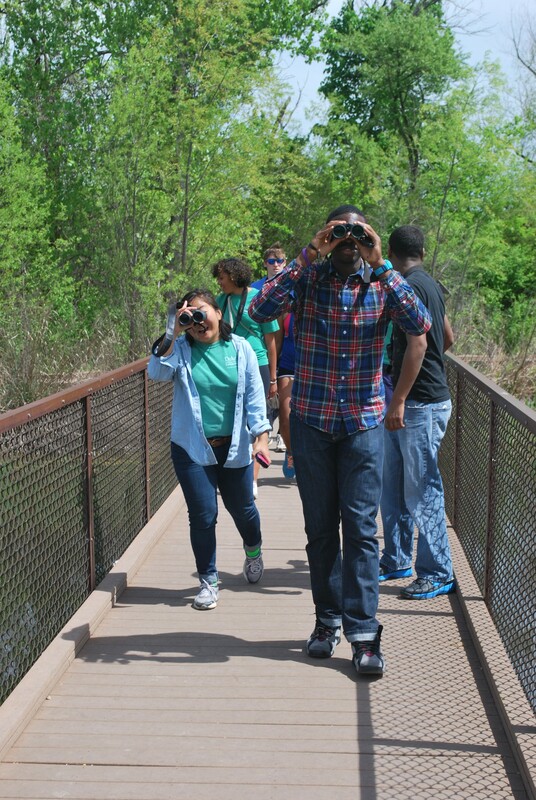 This spring, I had the privilege of serving as a teaching assistant for the Urban Restoration Ecology portion of the Duke Immerse program in Urban Environmental Justice & Social Entrepreneurship, in partnership with Dallas’s historically black Paul Quinn College. A team of faculty, staff, and undergrads from Duke and Paul Quinn studied and worked on socio-environmental issues on the Paul Quinn campus and in the surrounding predominantly black Highland Hills neighborhood, culminating in a community stream clean-up and plans for a stream restoration and mobile farmer’s market. All of us struggled from the start to adjust to and integrate the variety of backgrounds and expectations of everyone involved. Towards the end of spring semester, some severe bureaucratic hiccups prompted long and intense discussions of the racial, class, and gender issues inherent in the program itself. The undergraduate students did an admirable job of sticking together and hearing each other out through some very rough meetings. It was more of an education than I would have wished upon my students, but they handled the challenge with surprising grace. The real revelation for me came a bit later, as I watched the team work through some students’ disinclination to talk to Highland Hills community members about the very tentative plans the students had made for the mobile farmer’s market. Those students feared appearing to make false promises to the community, more than they worried about delivering to Paul Quinn administrators a plan handicapped by its lack of feedback from the community. I slowly came to realize that their reticence mirrored my own. We had become so afraid of saying the wrong thing to non-white people in need and in power that we hesitated to talk to them about their problems at all; we had let our fear of giving offense get in the way of doing good work. We forgot that our words, as scholars, only mean so much, and that the words of those with lived experiences of the environments we study matter too. Now I am trying to bring those lessons back home, and to instigate similar difficult discussions to the ones my students had here in the broader Nicholas School community. I think we need to have them. In a country where female professors of color are routinely taken for janitors or administrators, we conform to the prejudiced stereotype. As of fall 2012, the Nicholas School had zero faculty identifying as black, American Indian, or multiracial, even though those races make up more than 22% of Duke’s work force. We had just four Asian and two Hispanic faculty, including just one woman of each of those races, out of 51 tenure-track and 69 total faculty; the rest were white. Only one person of color had tenure. Indeed, 26 of 30 tenured professors were white men. Our faculty has low racial diversity even relative to broader Duke’s and to similar universities’. Nicholas School students are more racially diverse than faculty, but decreasingly so with academic progress. For example, in 2011, when the Nicholas School Diversity and Inclusion Committee tried to establish a baseline for diversity, it accounted for only 16 black students: 10 of 96 undergraduate majors (10.4 %), five of 174 master’s students (2.9%), and just one of more than 111 PhD students (<1%). This demographic structure is a classic example of the leaky pipeline model, in which diversity decreases up academic ranks. Note that this demographic data says nothing directly about parity or disparity of treatment, including compensation, workload, and working environment, across races. We have little official information about these issues. A report this spring by the Academic Council’s Faculty Compensation Committee found that across Duke as a whole, salaries generally do not differ significantly among white, Asian, and other races of faculty. Asian professors had higher salaries than other groups at the assistant professor level (95% confidence interval of 0.6-6.3%), and insignificantly lower salaries than other groups at higher professorship levels, whereas non-white, non-Asian professors had insignificantly lower salaries at the assistant professor level, and higher salaries (0.4-15.7%) at associate and full professor levels. This trend continued for distinguished professors, at which point non-white, non-Asian professors had salaries an estimated 15.3% higher, on average, than others’. However, only nine such professors exist in all of Duke University, and, as we saw, our most recent data suggests that no such person works in the Nicholas School. The Nicholas School features a statement about the value of diversity fairly prominently on its website. In the statement, the school envisions a more diverse future for itself, and recognizes that we need this outcome not just for reasons of morality and fairness, but for the quality of our scholarship. It acknowledges that “minority communities bear a disproportionate share of environmental risk,” and therefore the school “must engage and educate” these communities, if we want thorough information about the environment. Policy-makers and academics did not really recognize the pervasive problem of environmental racism until African Americans began protesting environmental injustices in the 1980s. So, we need minority and environmentally oppressed voices here informing Nicholas School scholarship, just to make sure we do not miss important facts about the world we study. All of us need to think about and discuss race, because to study environmental issues is to study racially unequal impacts. For example, in my own research, I thought about the impact of the Clean Water Act’s relative lack of regulation of man-made water bodies for a year before it occurred to me that racial minorities and other disadvantaged groups likely experience these impacts more, that the Act permits degradation of waters likely preferentially located near minority communities. (I cannot confirm or deny this hypothesis yet.) It took me so long even though two of the best-studied examples of 20th century environmental injustice in the United States, in Anniston, Alabama, and Hyde Park, Georgia, both involved predominantly black communities contaminated and sickened in part by ditches bearing water laced with toxic industrial waste. Perhaps I would have thought faster if we talked more about race in the Nicholas School. The Nicholas School currently attempts to address its own issues with racial discrimination through the Rising TIDE program and the work of the Nicholas School Diversity & Inclusion Committee. However, I submit that race is not a topic best left to the school’s official leaders and administrators alone figure out. Both to reduce the impacts of racism, and to better our scholarship, we all need to participate in conversations about race at the Nicholas School.